The Casio TE-2200 is very similar to the TE-2400 flat keyboard version but with raised keys. Ideal for Newsagents, Chemists and General Stores where the speed of a raised keyboard is required. Click here to go to the Casio website for technical details about this machine, or click the .pdf logo for more information. 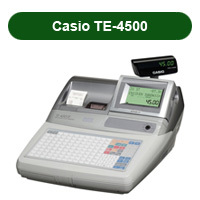 The Casio TE-2400 cash register is a simple, yet very powerful, flat keyboard, mid range cash register. Ideal for Café bars and retail sectors (5000 scanning records). This cash register reads scalable bar codes, has 77 one touch, flat buttons for newspapers and other fast selling products. Features also include drop in thermal rolls (no ribbon required), clerk interrupt to improve efficiency behind the bar, graphical logo and macro programming. All programming can be saved to a compact flash card. 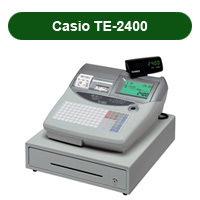 The Casio TE-4000 is a high performance system cash register, ideal for hospitality/café bars. Machine features include a twin station, thermal printer, 5 colour LCD display, clerk interrupt, tax tables plus shift level pricing for peak times. All programming can be saved to a compact flash card. 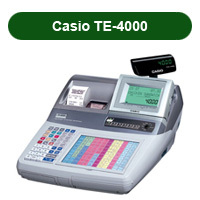 The Casio TE-4500 is a high performance system cash register with a full flat keyboard, ideal for Hospitality/Café Bars. Machine features include a twin station thermal printer, 5 colour LCD display, clerk interrupt and tax tables. A very robust design. All programming can be saved to a compact flash card.